Get Rich Slowly post about the The Balanced Money Formula which is an alternative to traditional budgeting where you allocate a % of your funds to wants, needs and savings. The Simple Dollar celebrated Two Years of The Simple Dollar: My 25 Favorite Articles of the Past Year There are several great articles in his 25 favorites. Jim at Blueprint for Financial Prosperity posts a handy Tax Equivalent Yield Calculator You can use it to figure how tax exempt returns equate to taxable investments. We have a Costco membership. It costs us $40 a year to be a member. We buy certain items there that we know are cheaper than our grocery store. One item I buy costs about $22 at Costco and its $28 at Amazon. We also get gas at Costco and their prices for gas are usually the cheapest in town. You can usually save 5-10¢ per gallon at Costco. But when I look at most of the items for sale at Costco their prices don't often seem that great. They have GOOD prices for sure, but I don't think they're usually the BEST prices. Both prices reflected a $300 instant rebate from Nikon. Costco and Amazon both had free shipping. For Office Depot you would have to spend $50 total to get free shipping. In all 3 cases Amazon.com was cheaper than Costco. Of course there are bargains to be found at Costco. Bulk food items and personal items are often cheaper at Costco than anywhere else. Costco does have consistently good prices. But don't assume they're the cheapest or even that their prices are better than other local retailers. Standard and Poor (S&P) has an index of home prices. Its called the Case-Shiller Home Price Indices. The Case-Shiller index covers home prices for certain major metro areas in the USA. They track the individual major cities and then also track a 10 city and 20 city composite index. The Case-Shiller index was developed by Karl E. Case and Robert J. Shiller. The index measures repeat sales of single family homes. They compare sale prices of individual homes over time. So for example if a home is sold in 2003 for $250k and then sold again in 2005 for $260k and then sold later in 2008 for $255k then this constitutes 2 data points. They look at all the single family home sales and track the increases or decreases in the data points over time. The Case-Shiller index gives a good general index of home values nationally. The S&P site has data for the index going back to 1987. So you can use this as housing data for the 20 metro areas for the past 21 years. 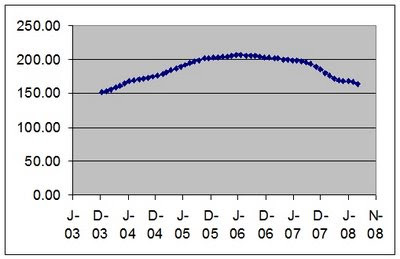 Looking at the last few datapoints in summer of 2008, it looks like the rate of decrease is slowing. Hopefully this is a sign that the bust may be bottoming out. Lets keep our fingers crossed. As you can see Los Angeles had the biggest boom and bust and the difference between L.A. and other markets is pretty extreme. But L.A. prices are still well above other markets for the longer term period. L.A. started around 94 in 1991 and then peaked at over 270 last year in 2007 and is now down to 189 as of August 2008. So that was a +187% boom followed by a 30% bust. But from 1991 to 2008 the prices in L.A. are still up about 101%. The best market shown was Seattle which went from 64.6 in 1991 up to 192 last summer and is now down to 175. Thats a boom of 197% and a bust of 9%. Detroit was the worst market of those shown. They started at 57 in 1991 and then peaked at 127 in 2005 and then is now down to 92 currently. So that was a +122% boom followed by a 27% bust. I looked back through the money saving related posts that I've made so far this year. I added up the total savings realized for this year and its about $915 total. Driving a fuel efficient car. SAVES = $117. My 4 cylinder engine in my Camry uses about $117 less in gas at $3 a gallon compared to the 6 cylinder option. Dropping to a cheaper plan on Netflix SAVES = $12. I evaluated my Netflix usage and decided the 2 at a time plan would meet my needs. So I dropped from the 3 at a time plan and saved $3 a month. Free magazine SAVES = $12. I got a free subscription of Wired magazine. 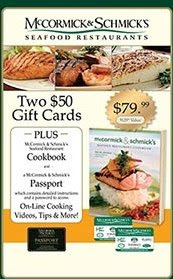 McCormic Rewards program SAVES = $100 I use the McCormick and Schmick rewards program and I got a $100 dinner certificate. Using discount restaurant gift cards SAVES = $80 Like I mentioned in my tips on saving at restaurants, I used Restaurant.com gift certifications and discount McCormicks gift cards from Costco. Save on classic car insurance SAVES = $470 I switched to a specialty insurer that handles classic car insurance specifically. I use Compact Fluorescent Lights SAVES = $61. My home is using almost all CFLs and I've been doing so for years. Cut cable costs by asking for a reduction SAVES = $115. I called Comcast and got them to cut my rate. You can play competing service providers against each other to get bargain rates. For this year my savings are going to be $115. We also made some money by having a garage sale EARNINGS = $500. Using credit card rewards EARNINGS = $300 I got back about $240 from my Citibank Dividend World Mastercard which gives 1% on all purchases and 2% on gas, grocery, drug stores, convenience stores, cable and utility bills. I have also already tallied over $60 on my American Express Tru Earnings Costco card. Using reusable grocery bags. COST = $0, from $2 cost and $2 savings I bought some reusable grocery bags. They've already paid for themselves. A smart strip COST = $28 from $46 cost less $18 in savings I used a smart power strip to automatically turn off my computer peripherals. I also bought a kill-a-watt meter. Using a auto-shutoff shower head COST = $10 from $30 purchase with $20 savings I have a shower head fitting that cuts off the water once its heated up. Between these 3 items we've spent $38 more than we've saved this year. But next year we'll save $43 on them and start to come out ahead. Of course everyones expenses are different so its not realistic to think everyone can cut over $1700 in spending by being frugal. But a lot of these items anyone can do if you aren't already. Using compact fluorescent lighting is an easy money saver. Negotiating on insurance or cable bill should be able to save most people some money. Looking for and using rewards programs with a credit card or discount gift certificates can cut your spending too. Back in June I evaluated my Netflix usage and I decided that I could cut back the number of DVDS on my plan. Originally I was on the 3 at a time plan which cost $17 per month. I then switched to the 2 at a time plan for $14 a month. Its been 4 months since we switched. I can say that the 2 at a time plan is working just fine for us and I haven't missed the 3rd movie at all. So that was $3 a month that we saved with no more effort or cost than simply taking the time to downgrade the plan. If you are using a monthly service with various plan levels then it is a good idea to periodically evaluate your usage and make sure you aren't paying for service you don't use. Cell phone plans would be a good item to evaluate in this way. My employer offers a service where I can get legal aid and services for a monthly fee. This idea has interested me. I figured that with a lawyer on retainer we could avoid hefty legal bills that might arise for various things like traffic accidents, filing a will, general advice or the unfortunate case of settling an estate. Legal bills can be hefty so buying some insurance towards it would seem like a decent idea. But does the cost of a pre-paid service justify the savings? The fee for the service my company offers me is in the $20-30 range per month so its $250-350 per year. A private company that offers such a prepaid plan is Pre-Paid Legal Services Inc. Their rates are $312 a year or less. LawPlan from Metlife costs $395 a year. So in general it seems the pre-paid legal services cost $250-400. A New York Times article that broke down spending on various categorizes as percents shows that legal services accounted for 0.3% of average consumer spending. So that means Americans are spending around $100 to $200 a year for legal expenses. So it seems to me that the potential average savings from a pre-paid plan are generally a lot less than the annual costs. On a pure cost basis I don't think the pre-paid plans would be a good idea. Why pay $250 a year for something that typically costs $150? I won't. Other considerations for pre-paid legal plans. You're locked into specific attorneys. If you get a lawyer from the plan who you dislike you won't be able to freely switch to another lawyer. Pre-paid plans only cover certain services. The plan that my work place offers covers some basic stuff but not other things. They cover wills, deeds, traffic tickets and some other services. They don't cover probate, divorce, and a variety of other common legal issues. You can get a free taco today at Taco Bell from 2-6pm. Details of the program. Its for the USA only. The free taco is part of a promotion with Major League Baseball. If you are considering buying a rental property as an investment one of the most important things is to make sure you're getting a good buy. To property evaluate a purchase of a rental property you need to know what the income is and what the expenses are. Key information you should find out about a property to evaluate a purchase : are Income, costs and Price. What is the gross rent and vacancy rate? Rental income may be stated in the sale listing but it is possible the seller or realtor is exaggerating the income by either neglecting the impact of vacancies, assuming that you can rent for more than it currently is or both. You should get the actual income data on the property and then assess if the rents are practical for the location. The fixed costs and bills including taxes, insurance, all utility bills paid by the owner. The variable costs associated with running the property such as repair and maintenance costs, management fees and lawn care costs. I would also ask the seller about any liability for major repairs or services, for example the city may plan to install sewer service in the near future and paying for a connection could be a pending liability on the property. You can request documentation on the costs from the seller. If the seller is hesitant to provide copies of bills or cost records then its possible they are hiding something. Generally the asking sale price plus any closing costs is all you'd as far as the price. This one is fairly straight forward. There are some other items to be aware of. You should determine if the property is in poor condition or not. A property that is in disrepair would likely have higher ongoing maintenance costs. The quality of the tenants in the unit would also impact the value of the property. Once you have the income and expense data then there are a few ways to evaluate a price on a property: You can use the Rule of thumb of 100 x rent, Calculate ROI on your equity or figure the CAP rate. The 100x rent rule of thumb will give you a decent starting point. Determining ROI or CAP rate are both more in depth evaluations to put a property purchase in terms of return. Using these methods will help you compare different purchases in terms of investment return. Rule of thumb method: Don't pay more than 100 times the monthly rent. With this method you're using a basic rule of thumb. You take the monthly rent and multiply by 100 and that is the maximum price you would pay for the property. This is a good starting point for property measurement. Example #1: A single family home is on the market for $110,000 and it rents for $950 a month. Since 100 x 950 is $95,000 then this is not a good buy. Example #2: A duplex is on the market for $95,000 and the rent is $500 per unit. Total rent is $1000 a month and 100 times that is $100k so the $95k asking price is OK. Calculate the cash flow and rate of return estimate. Using this method you are going to do a little more math and estimate your income and expenses then make sure you're getting a good cash flow. For this to be effective you need some good data on the expenses and rent income. First figure out the rent income. Next add up the estimated expenses including mortgage if its financed. Subtract the expenses from the income to determine cash flow. If the cash flow versus equity is favorable % return then the house would be a favorable investment. Example #1: The single family home is generating $950 a month. Your total rent is $11,400 and you expect 95% occupancy rate for income of $10,830. Your expenses are going to be property tax and insurance of $2000 and your mortgage is $528 a month x 12 for $6,336 annually. You estimate other expenses and maintenance of $1000 a year. So rent = $10,830 and expenses = $9,336. Rents less expenses gives a cash flow of $1,494. If you put down 20% for $22,000 then you'd be making about $2k a year on $22k or roughly 6.7% return on your down payment. This might be an OK buy. The Capitalization Rate or CAP is the rate that you gain income for the investment. You figure the CAP rate by figuring the net operating income and dividing by the price. So for a general example if the property nets $10,000 a year and it costs $100,000 then the CAP is 10,000/100,000 = 10%. This represents the income return from the property if it is owned outright. CAP rates can be in the 3-10% range typically. The higher the % the better. Taking the time to evaluate all the costs and expenses of buying a property as well as examining the condition of the unit and the nature of the tenants is certainly worth your time. Once we looked at an apartment building that looked like a great deal on the surface. It was being sold for around $150,000 and it was a 6 unit with rental income of over $25,000 a year. On the surface the property looked like it should have a good return. But the more we looked at it the more problems we saw. First the property was in need of repair. This would lead to higher maintenance costs. Second the owner had some difficult tenants which could ultimately cause the need for evictions, losses in rent and repairs, and extra vacancies. Lastly the property was using shared heating and electric so the owner was responsible for paying all the heat and electric utility costs which would be a major expense. I added it up and the expenses amounted to over $20,000 leaving less than $5000 annual income after expenses. That would be a pretty poor return on a cash investment of $150,000 and the property would have caused us a LOT of work as well. If we had jumped into the purchase too soon without getting more data then we might have ended up with a very poor investment. The extra time we took to get more details paid off in saving us from making a bad purchase. If you already own or you are considering purchasing a property to rent, you should determine the right amount to rent the property for. HUD's Fair Market Rents - Go to the HUD FMR site and look up your city/metro area. These rent prices are rough average figures for given number of bedrooms in a unit. This is an overall average for an entire city so it won't differentiate between good and bad areas. Research Craigslist & newspaper - Check the classified listings on Craigslist and for your local newspaper. Skim through the listings and record the rents for similar units. Rentometer - Go to the Rentometer website and enter your information. It asks your rent rate, if you have a current rate then use that, or just use a guess figure. The site will indicate how your given rent falls in the range and show a meter of low to high values for rents in that area compared to other rentals. Take each of these sources with a grain of salt. Your property is unique and you can't pull an average number out a pile of properties and assume that applies as well to your property. Lets look at an example: In my city the FMR is about $800 for a 2 bedroom. I skimmed through Craigslist and it looks like you can get 2 bedroom rentals for $810, $775 and $848. I plug in my address and rent for a 2 bedroom in a duplex into Rentometer and it tells me that $800 is close to the median and it indicates the range of rents is $600 to $1100 for the 873 properties it checked within 3 miles. Given all this I think that renting a 2 bedroom for about $800 would be in the middle. You do need to think about your specific property and how it would compare to other rentals. Look at all the features your property has and what other properties have. You need to look at what each property has and do a realistic apples to apples comparison. Rents will be higher if you have more features such as a new building, fenced yards, fireplaces, washer and dryers, etc and rents will be lower if the building is older, if the neighborhood isn't as nice, if its close to an airport or freeway, or if the property is lacking features most homes might have. Once you've determined what rents are in your market you then need to make a personal choice about whether you want to rent higher or lower. There are pros and cons to each. If you choose to have lower rents then it will rent faster and retain tenants longer but your income will be lower. If your rents are higher then you'll make more money every month but it will be harder to fill vacancies and tenants might move out faster and more frequently. Free Money Finance points out that we can get a Free Taco at Taco Bell next Tuesday. The Simple Dollar has some ideas to Stop Wasting Money on Disposable Things including using reusable rags instead of paper towels which could save you $50-80 a year. Jim at Bargaineering discusses the investment strategies that Harvard and Yale use for their endowments in his article How To Invest Like Harvard & Yale. Real estate can be a good investment but it isn't right for everyone. When I talk about real estate investment I mean buying rental property and renting it to tenants for long periods while rental income is used to generate cash and possibly pay a mortgage. Do you want the extra work involved? Whether you are planning on managing the property yourself or just hiring a professional property manager there is work involved in owning real estate. See my previous post addressing if you are cut out to be a landlord. Can you stay in the investment for several years? Rental real estate is a long term investment. You will not make much money if you buy and sell property in a year or less. Closing costs and realtor commissions will eat all your profits. If you might move in the next year or two or if you need your money faster then buying rental real estate isn't a good idea. Is your market good for rental investments? Some markets are much better for rental investments than others. The thing to look for is the ratio of rents to property values. If renting a home is much cheaper than buying a home then its not a great market to be buying homes. Certain cities or areas like San Francisco are pretty bad places to invest in. So look to see if your market has a favorable rent / price ratio. Calculating rate of return on rental property investments. The three elements of a rental property return are: the cash flows from rents, the appreciation of the property and the decrease in principal due to principal payments. If you add these three elements together you get your returns. To figure the value of an investment you need to look at the value of the returns versus the value of money you put into the investment. So the return on investment (ROI) from the investment is returns / equity. I'm going to present a simple way of figuring your return rate on a property. I'm not considering tax implications just to keep it a bit more straight forward. The example property I'm using is not a realistic property for most markets and I only use it for example purposes to show how the math works. Cash flows are real receipts of cash from rents minus your expenses. You would figure your cash flow by subtracting all your annual expenses from your annual rents. Appreciation in the property is generally going to be an estimate of unrealized gains. Because of the cost you don't want to get professional property appraisals every year but you can use basic gauges of value to estimate the value. You could use a website like Zillow.com or skim the prices of properties currently selling at Realtor.com Realtor.com also tracks median home values for large markets and you could use those general numbers as a estimate of what your property may have increased (or decreased). For example lets again look at the duplex you bought for $100k. If you look on Zillow and they say it is now valued at $105k and Realtor.com shows median prices in your area increased 5.2% then you can estimate that the property appreciated about $5000 for the year. But again this is just an estimate. If you go and try to sell the house you may or may not be able to get that price. Reduction in principal is through the principal payments of the mortgage. Part of your mortgage payment will go towards principal (lets ignore interest only loans). SO at the end of the year you'll have a lower principal balance then at the start. At the start of your mortgage term the amount of the mortgage payment going to principal will be fairly small compared to the payment amount. But towards the end of your loan, your payments will be mostly principal and this amount can matter a lot. To figure your equity increase you need to look at your mortgage statements. Normally your statement will tell you the outstanding principal. Or you can also look at the original loan paperwork which ought to include a table of amortization showing the amount of principal paid on each month. For the example duplex with a $100k loan you had $20k down so you start with $80k principal. After one year your mortgage payments would have put $982 towards principal. So your increase in equity is $982. If you combine the cash flow, the appreciation and the reduction in principal then you have your total return for the year. To figure your return on investment you divide your investment by the return. That 30% return sounds great. However realize that this is not realized gain and doesn't represent cash in your pocket. The $1,940 in cash flow from rents is real cash in hand. However the appreciation and increase in equity is stuck in the value of the property and isn't realized. To obtain those gains you would have to sell the property. When you sell the property you'll probably have to pay realtor commission to sell it and you may also have to pay capital gains taxes. Another reason you're showing 30% return with this example is that the property is highly leveraged so you're taking risks. If you were unable to rent the property for a few months then that would eat all your cash flow, or if the property depreciated a small % then your return could easily be negative. In this case thats $1,940 / $20,000 = 0.097 = 9.7%. To determine the real return you would have to include the cost of selling the property. Lets look at another example where the returns aren't good. Lets consider the same property bought for $100,000 with 20% down. Lets say you had the same basic expenses but you had to replace a failed water heater for $550 and when the one unit was vacant the renter didn't pay 1 month rent and it took 2 months to rent it so you lost 3 months rent. That makes your expenses $550 more and your rents $800 less. So while before you had rent of $9200 and expenses of $7260 now you have rent of $8400 and expenses of $7810. So your cash flow = rent - expenses = 8400 - 7810 = $590 Lets say the property was in Little Rock Arkansas which has seen about 0.8% appreciation in the past 12 months. SO if the property started at $100k and increased .8% then it would have appreciated $800. Your principal reduction would be the same at $982. Thats still not a bad return by any means. But what if the expenses ran over another $1000 or if the property didn't appreciate or depreciated as many markets are doing right now. With a little bad luck or a bad market you could actually see a negative return. Generally you'll have positive returns from rentals in the long run. But you should measure and watch your return rates to make sure your property is giving a good return on your investment dollars. Dealing with vacancies - Any time a renter leaves you will need to clean up the unit and then rent it. This is probably the most time consuming part of being a landlord. You need to advertise the vacancy, clean up the apartment, screen potential renters, show the apartment to people, do background checks, do a walk through with the old tenant and the new tenant, return the security deposit to the old tenant, and get the rent and deposit from the new tenant. On average you'll probably have to deal with a vacancy every 12 months. Maintenance - Something might break at any time and when it does you have to fix it or pay someone else to. Be prepared for random calls at any time and day. If a tenants heater goes out at 2am on Christmas morning then its YOUR responsibility to fix it. If a picky tenant is annoyed by how the blind in their kitchen doesn't go up and down properly then you ought to go look at it. The more work you do yourself then the more time it will take. But even if you hire all work you'll still have to spend time managing whomever you hire. Paperwork - There is a lot of paperwork involved in running a rental. Among the things you must do : you have to record all the rents, you need to record when people pay and if they're behind, you have to deposit checks, you have to handle utility bills, you usually need to pay a mortgage, property tax and insurance, you need to keep records of all your expenses, come tax time you have to fill out a separate schedule to report your earnings and expenses and calculate the depreciation. Collecting rent - Usually collecting rent is as easy as opening the mail and cashing a check. But inevitably you will have renters who get behind on their rent. When renters don't pay you have to chase them down to ask for he money. This can be time consuming. Handling problems with tenants - Part of the time as a landlord you are acting as a sort of police officer for the rules of your property. If a tenant parks their car on the lawn or makes too much noise, it is up to you to fix the problem. Sometimes tenants will have arguments or conflicts with one another and you need to decide what to do about it. You may even have to call the police on a tenant if they are breaking the law. Evictions - Worst case scenario when you have a problem tenant will be evicting them. Evictions are not necessarily as bad as it may seem, many times the process is fairly streamlined by state laws. There rules to be aware of when doing an eviction so you have to familiarize yourself with the process. The exact rules vary from state to state. But in general you first have to serve notice. Usually tenants will leave with a notice, but if they dont' you may need to take it to court. If the tenant still doesnt' leave then the sheriff will need to come and physically remove them. Fair and tolerant - You will need to be open to working with and renting to people of various walks and lives and various attitudes. Discriminating based on things like race or religion is illegal as a landlord. To be a good landlord you should be able to work with and get along with a variety of tenants. You also need to be fair with the tenants and do what is right and ethical. Detachment - If you are prone to becoming emotionally attached to people you deal with then this can be a problem as a landlord. If you consider a tenant as a friend then its very hard to deal with your 'friend' being behind on their rent. Some tenants will abuse such situations and feed a sympathetic landlord fabricated sob stories. Do it yourself ability or knowledge - It really helps to be able to fix things yourself. It saves money and often time as well. But if you aren't an all around handyman then it helps to at least be familiar with repair and construction work in general. If you're hiring plumbers then its best to know what work will require so you know you're paying the right amount. Legal and business savvy - To be a good landlord you should be able to handle or understand all the financial dealings. You must also understand tenant landlord laws. So you can see that there is really a lot of work and skills involved in managing a rental property. If any of the above is not something you can handle or want to do at all then I wouldn't recommend that you become a landlord. If this kind of work is fine to you and something you can easily handle and have the time available to do then you might consider managing property. If not then you might want to stay out of direct real estate investment or possibly invest in rentals but use a professional property manager to handle the work. I've been considering switching TV providers from Comcast cable to Verizon FIOS. Verizon is my local phone provider and they keep sending me fliers in the mail to switch to their FIOS TV service. I looked at their website and they are charging $12 less a month for the HD channel package and they have an offer for a free DVR for 12 months. I pay $14 a month right now for my DVR from Comcast. So if I switched to FIOS for a year I'd be saving $26 a month off my bills. But I've heard that Comcast and Verizon offer deals to customers to keep them from switching and they offer incentives to get people to switch back. So I figured it couldn't hurt to call Comcast to see what kind of offer they might make to keep my business. I called and talked to the billing person and explained that I could save over $20 a month with FIOS. She tried to sell me a bundle of phone, Internet and TV but I am not currently interested in switching all 3 services to a bundle. So I ended getting transferred to someone else who could talk about just TV and maybe offer me something for that. The second person I talked to gave me a discount on the TV package. She offered me $15 off a month for 6 months, a free DVR for 3 months and free HBO for 1 month. If I add that all up over a 6 month period it amounts to $148. Per month thats a $24.67 savings that I'm getting off the normal Comcast bill, almost the same as what I would have saved with FIOS. All together the call took about 15 minutes. 15 minutes saved me $148. Now I could have saved about as much by switching to Verizon. But there is still a bit more time and effort involved in that and right now my Comcast service is working just fine for us. If you're considering switching providers just to save some money then why not give your current provider a call and see if they'll offer a discount to keep your business. This tactic could work with cell phones, cable TV, Internet providers or any kind of service fee where they have competition and offer discounts to attract new customers. If you look at the chart on GasBuddy of prices for regular gas in the past 3 months, you can see the US average has dropped from around $4.10 to $2.88 today. Thats over $1.20 drop per gallon of gasoline in 3 months. The typical US driver puts about 12,000 miles on their car each year and gets around 20 MPG. So thats about 600 gallons of gasoline used annually. A $1.20 cost drop equates to about $720 per driver per year. Magazines.com has a number of trade magazines for free. Most of these are related to specific industries and are not your typical leisure magazines. So they are only going to appeal to a small niche audience. But if you happen to be in one of the industries served by the magazine then a free subscription might be worth getting. Its always good to keep informed of developments in your industry. Costco has gift card packages for certain restaurants where they sell 2 x $50 gift cards for $79.99. So you're getting $100 worth of dining for about $80. That is 20% off on the cost of the gift cards. I actually mentioned this one in passing a while ago in my post Saving at Restaurants #3 - using gift cards but its a good money saver that I wanted to elaborate on. Brooks Steakhouse - In Denver. I've seen other restaurants gift cards plus some local theme park gift cards sold at my local Costco off and on in the past. Their inventory varies as usual for Costco. So you might check out what they have in stock at your location. All of these restaurants appear to be high end restaurants. So you should be aware of the total costs of dining at the restaurant before you get a gift card. In other words, don't spend too much just cause its 20% off. But if you're looking to save a few bucks for a nice dinner out then this is an easy way to get $10 off a night out a couple times. They could also make a good gift for someone you know who would like a nice dinner out. Go San Diego card for 3 days of park admissions for $130 for adults or $100 for children 3-12. Plus they have discount iTunes cards as well. $50 iTunes cards for $47. So, check your local Costco and/ or visit the Costco.com website to look for some good deals on discount price gift cards. In Investing in a Bear Market at Get Rich Slowly, JD talks about investing in the current market. He suggests you test your risk tolerance and gives a links to calculators : MSN Money risk tolerance quiz and Kiplinger: Test your risk tolerance. JD also recommends that you set investment goals and diversify. Its actually all good advice in general and not just a bear market. Bargaineering has the article Best International Credit Card where he lists the different fees that some credit cards will charge when using them over seas. The fee rates range from 0% up to 8% so it can make a big difference in travel spending. Fivecentnickel points out that you can now Track Your Finances Free With Quicken Online Used to be that Quicken Online was $2.99 a month but they are now offering it as a free service. fivecentnickel also has a post on How to Calculate Tax Equivalent Yield where he shows you how to figure out how a tax exempt investment equates to a taxable investment. Over on My Money Blog I found this post that pointed to a coupon for a free tall cappuccino. The coupon is for the Barnes & Nobles Starbucks specifically and not valid at college bookstore locations. The coupon is good for a FREE cappuccino, latte, espresso, coffee or hot tea. It expires 10/31/08. The article Home Prices By Metro Area lists 292 individual metropolitan areas and it gives the change in home values for the past quarter, 1 year and 5 year periods. The article was from August so its a little old now but its not too far out of date. 72% of home markets saw home values increase over 20%. 41% of markets had increases over 35%. Only 5 cities had decreases in value and all 5 of them are in Michigan. The highest increase was 83.5% in Honolulu and the biggest decrease was -11% for Detroit. The 10 cities with the largest 1 year declines all have 5 year increases of at least 8%. And half of them have 5 year increases over 30%. For example the Riverside California market dropped 22.9% in the 1 year period but was still up 47% for the 5 year period. As a generalization the areas with the biggest 1 year decreases also have large 5 year increases. 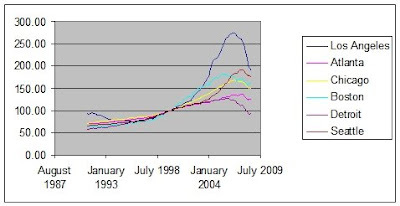 California, Florida and Nevada have had large boom and bust cycles. Michigan and Ohio have had some of the worst markets in both the 1 and 5 year periods. There are 22 cities with decreases in the past year and less than 10% increase in 5 years. Of those 22 total there are 12 cities in Michigan and 5 in Ohio. The term Dollar Cost Averaging refers to a method of buying an investment by spending a fixed dollar amount at regular intervals. The reason for investing this way is to avoid risk in volatility in the market. If the market is going up and down over time and you were to make one large sum purchase then you might randomly hit a high or low point in the market. If you luck out you might hit the market just right and buy at a low, or you might have poor luck and buy at a temporary high value. If you bought this stock on April you'd pay the most at 145 but if you bought in January you'd pay the least at 105. If you dollar cost averaged then you'd pay an average of 123.3. If you were to invest $1000 a year and you timed things just right to hit the minimums then you'd have bought low and seen the best return. Buying $1000 of an index at the low points would give you $4,265 worth today. If on the other hand you timed things poorly and bought at the highs, then you'd have just $3,690 today. To avoid this volatility and average out the cost of your purchases you could invest $1000 / 12 or $83.33 each month. 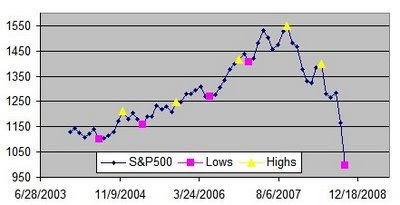 This would be an example of dollar cost averaging. If you instead bought $83.33 each month then you'd have about $3,804. This gives you an average value somewhere between the maximum and minimum. So that gives you a Maximum of $4,265, result of Dollar Cost Averaging of $3,804 and Minimum of $3,690. As you can see the Dollar Cost Averaging method would have given you an average result. The yields on municipal bonds have been edging up lately. The Composite Bond rates at Yahoo shows a rate of 5.57 for a 20 year AAA rated municipal. If your marginal tax rate is 30% then that equates to a 8% taxable rate. The Bank Deals blog tracks high interest savings and CD rates. They have frequently updated posts with deals on CDs and savings. They do a weekly summary of rates and best deals like their October 4th weekly summary. You can see the deals in your state or look for national deals. If you're looking for a good rate on a savings account or CD then check out Bank Deals blog. My UpDown account is currently down about 8% since I started in March. Last time I reported my performance on UpDown I was down about 1%. I was down to 14% but it rebounded a lot today. By comparison the S&P 500 is down about 25% in the same period. So I'm still beating the index by a pretty wide margin. I bought some AT&T and GE. Both are trading at pretty low values and have decent dividends with both currently yielding over 6%. I figured that you couldn't go wrong with these blue chips and buying them at a low price would be a long term winner. I also bought more of the Glimcher REIT (GRT). It dropped into the $5 range and its dividends were yielding over 20%. Nothing had changed in the companies financials so it was even more of a good value at this point. That >20% dividend yield was very attractive. This is a review of Warren Buffet Speaks : Wit and Wisdom from the World's Greatest Investor by Janet Lowe. I read the hard cover from 1997 but there was a 2nd edition published in 2007. The book is a collection of quotes from Warren Buffett. The quotes are collected by the author and presented in chapters on various categories such as About Life, About Friends, About Work, About running a Business and About Investing. There are 170 pages with quotes from Buffett. The quotes are sometimes introduced with context information. If you like Warren Buffett then this should be a fun and interesting book to read. The quotes are often entertaining and insightful. Warren Buffet Speaks : Wit and Wisdom from the World's Greatest Investor does not have instructions or tips on making a lot of money. The book does not go into how to practice value investing or otherwise offer investing information other than what you can glean from investing related quotes, which really isn't too much. The book is a quick and entertaining read and as I said before if you like Warren Buffett then you'll probably find it interesting. Look for a copy of Warren Buffet Speaks : Wit and Wisdom from the World's Greatest Investor at your local library. The BLS Occupational Employment Statistics has data on earnings per occupation. They break the data down to show what the median income is and what the bottom 25% makes, what the top 25% makes and what the top 10% makes. If you go to the page and then use their 'multi screen data search' databases tool you can find all this data for any occupation they track. I did a search for all occupations and all data and then looked for annual earnings values that exceeded the $145k maximum that they track. All together among the occupations listed below 1,091,915 people make over $145k income. I present lists of jobs where the top earners make over $145k below. For the lists, the occupation is listed first, then the BLS number is in () and the total people in that occupation is then given last. Occupations where the top 10% of earners make over $145k are below. Occupations where 50% of the people make over $145k are below. There are 424,120 people total in this group so 212,060 of them make over $145k. There are 107,980 total people in this group so 80,985 of them make over $145k. Within the general Management field listed in the first group there are several subcategories. One of those is CEO's. There are 299,160 CEO's in the nation and their median income is over $145k. 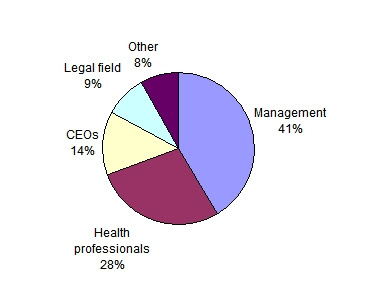 If you look at the total group here there are over 1 million people making over $145k and they fall into a few main categories as shown in the following pie chart: There are of course other people working in other jobs who also make over $145k. There are various salesmen, high paid engineers and professors in various fields making high salaries. On a recent Oprah show they had a frugal family by the name of Heinz. The same family was previously featured in a Parade article. One thing they talked about on the show is having a $5 a month cell phone plan. The Parade article says: ""The couple pays $5 a month on each of two cellphones, but only so they can reach each other in an emergency." On the show she also said that the plan had rollover minutes. But where do you find such a $5 a month cell phone plan with rollover minutes? I haven't been able to find the exact same kind of plan with both rollover minutes and a bill of $5 a month or less. I looked through both the 10 page discussion in the comments from the Parade magazine article and over 120 posts on the Oprah page and nobody there new of such a plan. One person thought it might be an old Virgin Mobile plan that is no longer offered. Maybe she has a plan only offered in some regions. I can't find the exact same plan but there are plans that are close. Previously I discussed Pre Paid Cell Phone Service and I listed some fairly cheap pay as you go or prepaid cell phone plans. AT&T Go Phone has rollover but the rates are higher. You can get $25 for 3 months or $100 for a year, either way works out to $8.33 a month with rollover. So if you use a cell phone very little and really only need it for true emergencies then the T-mobile plan would probably work best since its as cheap as $3.33 a month. But if you use your phone a bit and want to keep your minutes then the AT&T plan is pretty good option and only $8.33 a month. Either of these choices are pretty cheap compared to a typical $40-80 cell phone bill, but they also only work if you use your cell phone very little. Creating a CD Ladder for Your Emergency Fund or Other Savings to Earn a Better, Safe Return from Trent at The Simple Dollar discusses the how and why of making a CD ladder. Check the NCUA to make sure your Credit Union is insured. WE've heard a lot of news lately about the FDIC. The financial folks have given frequent reminders that we should make sure our bank accounts are federally insured by the FDIC. But what if your money is in a credit union instead of a bank?
" NCUA -- short for the National Credit Union Administration -- is an independent federal government agency that charters and supervises federal credit unions and insures accounts in federal and most state-chartered credit unions across the country through the National Credit Union Share Insurance Fund (NCUSIF), a federal fund backed by the full faith and credit of the United States government." So if you use a credit union then make sure they are NCUA insured. You can search the NCUA database here to check and see if your credit union is insured. Save 70% off $25 Gift Certificates. Pay $3 when you use the code SAVE. Valid 10/10/08 through 10/13/08. Thats a $22 savings per meal. GDP is the Gross Domestic Product and it is a basic measure of an economy's production. According to Wikipedia: Nominal GDP growth is GDP growth in nominal prices (unadjusted for price changes). 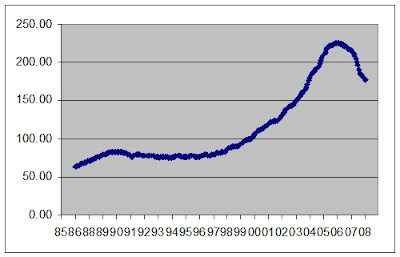 and Real GDP growth is GDP growth adjusted for price changes. The St. Louis Federal reserve has GDP data going back to 1947 at this page. The Data 360 website has this page that shows year to year % GDP growth based on the data. Average Nominal GDP growth is 6.77% per year and average Real GPD increased 3.32%. 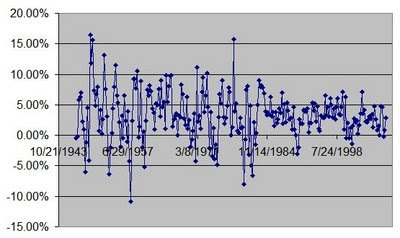 Nominal GDP was negative only 12 quarters out of 245 or about 5% of the time and Real GDP was down 37 out of 245 quarters for about 15% of the time. What are the definitions of recession and depression? It seems that most Americans right now think we're either in a recession or a depression. According to a recent Gallup poll conducted Sept 26-27: 36% of Americans polled believe we're in a recession and 33% believe we're in a depression. But what exactly constitutes an economic recession or an economic depression? An economic recession is defined as 2 quarters of negative economic growth as measured by GDP. An economic depression is when the economy has negative growth of 10% or more. These definitions are common rules of thumb used. It appears that there isn't an official agreed upon technical definition for the terms. But these are the common definitions used. According to the BEA: The 2nd quarter of 2008 the US economy grew 2.8% and the 1st quarter of 2008 we grew 0.9%. So we haven't yet hit a recession or depression as far as the current data shows. Its possible that in the 3rd quarter there might be negative growth but we won't know that until the figures come out. According to the BEA release schedule, the advance figures for 3rd quarter GDP growth are due out October 30th. A depression is a pretty severe event and we haven't hit 10% loss in economic growth for over 70 years since the 1930's when the Great Depression occurred. The myFico website is running a sale right now for 20% off of your 3 FICO scores. The sale runs until October 22nd. "It can be harder to get loans these days, even if you have a great FICO score. Over 90% of lenders use FICO credit scores, among other factors, to determine your credit risk. Make sure you're putting your best foot forward by knowing your FICO scores and taking steps to better manage your credit. For a limited time, get 20% off FICO Credit Complete - that's all 3 FICO scores for just $38.28 (normally $47.85). Enter promo code FALLFCC11 when you order to receive the discount. Offer ends October 22nd, 2008"
This is a pretty good price for all 3 FICO scores. If you want the actual FICO scores you generally have to pay and it is usually $15-16 each for them. If you haven't done so then I'd also strongly recommend you check your annual credit report via the governments website. For that go to AnnualCreditReport Be careful of other private companies advertising free credit scores, what they are usually doing is pitching a montly or annual subscription to a paid product with a free trial period. FICO scores and credit report are separate things. The FICO score is the number from 300 to 850 with higher being better. The credit report is a summary of all the credit transactions and standing for your open accounts but it has no credit score. With all the economic problems we've had lately some people are turning to gold as an investment or potential safe harbor for their money. Gold has increased significantly in the past few years. Gold has doubled in value since 2005 and had an annual growth rate of about 26% from 2005 to 2008. That really is a good return especially compared to the stock market and real estate which have both dropped in the same time. Its not uncommon to see people arguing that gold is where you should put your money. But how has gold performed as an investment long term in the past? To get historical gold prices lets look at the Kitco website. They have historical prices for gold dating back to 1833. If you look at the yearly charts and data for 1833 to 1999 you can see that gold moved very little in price for the period 1833 to 1971. Gold was $20.65 an ounce in 1833 and it was $40.80 an ounce in 1971. From 1930 to 1971 gold grew in value at an annual rate of 1.7%. Before the 1970's gold saw little increase in value. For the 1970's and later gold started to increase. 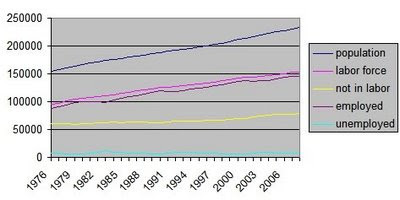 From 1970 to 2008 gold grew at an average annual compound growth rate of 8.8%. Right now gold prices are in a boom. Doubling value in 3 years is a very high growth rate. Its hard to time the market, but we know busts inevitably follow booms. Historic trends for gold are not quite as positive. Gold peaked in 1980 at $612. It then dropped to the $300-400 level for several years and dropped down below $300 in the early nineties. If you had put money into gold in 1980 at $612 and held onto it until today your average annual return would be just 1.1%. Gold prices are volatile and returns on gold investments have not been attractive over the years. In my opinion gold is not a solid investment. It has high risk and does not have consistent high return. The website Zillow.com has listings of houses for sale and it also has the foreclosure homes as well. So you can do a search for an individual city or zip code and then filter it by foreclosures to see the foreclosures in that area. Doing this you can see a rough number for the amount of foreclosures in a city. For example if I search for Anaheim, California and look for foreclosures it says there are 11,555 foreclosures out of 35,678 total homes. That means that 32% of the homes for sale in Anaheim were foreclosures. Note that the data on Zillow is not comprehensive and it may be lacking information. I don't know where they get the foreclosure and for sale numbers so it may be lacking some of either. So this is just a rough estimate of foreclosure rates. Again, let me point out that this data is probably not the full picture so it may not be a real reflection of the amount of foreclosures in a specific city. I'm not sure of the accuracy of the numbers at Zillow so take this with a grain of salt. It is pretty clear that some cities have a lot of foreclosures and some cities do not. Madison Wisconsin only has a few foreclosures on the market and Las Vegas has a lot. Realtytrack also tracks foreclosure rates. This article from last month has foreclosure rates per state and for certain cities. The Bureau of Labor Statistics (BLS) is a wealth of information. One area of data that they track is the unemployment rate as well as other employment statistics. Employment data is at their CPS page. If you go to the site you can see some current statistics summarized on the right column. The unemployment rate is 6.1% for Sept. 2008 and the number of unemployed rose 101,000 in the month. If you scroll down the page you can get to CPS databases. Using that you can look up historic data. I did this for unemployment and employment figures and created the charts below. 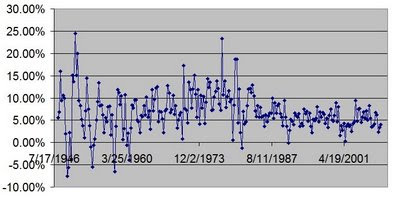 I made this chart myself for data for 1976 to 2008. The BLS has figures going back to 1948. They also give a table of the data. The average unemployment rate for 1948 to 2008 was 5.58%. 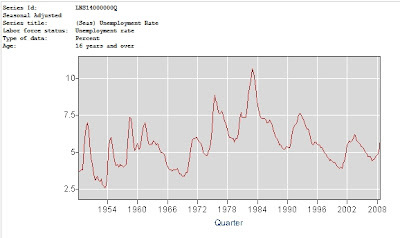 Unemployment was over 6% in about 2/3 of the past 60 years. The BLS also tracks figures for the # of employed people, the total population, and the number of people in the labor force. When figuring employment they only consider the population of people who are over 16 years of age and not in prison or the military. So the population number is mainly people over 16 years old. The Labor force is then the number of people who actually work or try to. The labor force is a combination of the employed and the unemployed. The unemployment rate is the % of people in the labor force who are unemployed at any given time. So the unemployment rate is only among those people who normally work and doesn't count people under 16 years old or who are not in the labor force. People not in the labor force would include people who are retired, in college or financially independent, etc. 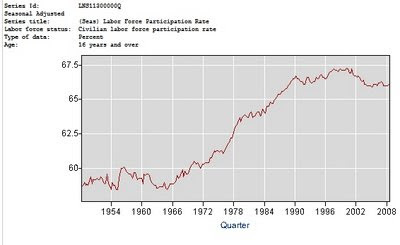 Below is a chart of various employment related figures for the past few decades (the numbers are in 1000's): So for this you can see the overall trend for the labor force, employed people, unemployed people and those not in the labor force. The number of people in the labor force versus those not in the labor force has changed over time. One interesting chart to look at is the % of population in the labor force over time. Using the graphing on the BLS site I got the following chart. This is interesting since you can see that starting in the 1960's and increasing through the 1980's the % of the population that participated in the labor force grew steadily from roughly 58% in the 1950's to 66% level in the 1990's and beyond. I would assume that this is due to two major factors: first, more women working and second, more households needing two incomes to support themselves.